For brand executives, it’s no surprise that if you don’t provide high-quality service to clients, they will inevitably take their business elsewhere. What I’m sure we can all admit to forgetting from time to time, is that being liked personally plays also plays into the equation. It’s simple: people like working with people they like. 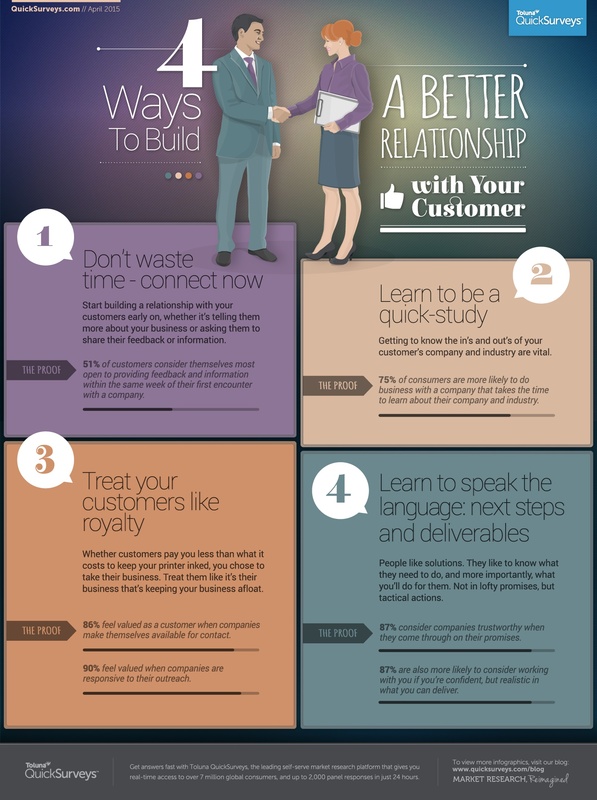 Here are some tips, supported by actual data, to ensure your personal relationship with your customers is as strong as your professional one. Eight hundred people were polled. Accept that bonds take time. Relationships take time to develop. Even if you exceed expectations quickly on the business, side, there is no amount of quota-beating that will make your clients immediately like you on a personal level. Forcing a client to divulge their feelings too early on will come off disingenuous, because, well, it is! And conversely, over-sharing information about yourself and expecting the same back quickly is off-putting. So put the time in. Get out of the conference room and go have a cup of coffee – or even a beer – with them. And ask them questions you actually want the answers to. Starting an organic conversation will help lead to an organic personal bond. Learn to be a Quick-study. Getting to know the in’s and out’s of their industry and company are vital. In fact, 75% of people are more likely to do business with a company that takes the time to learn about their company and industry. However, don’t assume you’re an expert just because you looked them up on Google and Wikipedia; know the history, recent industry headlines, and who the major players are. This will help show that you not only have a decent understanding of their world, but that you want to know more. Go in to that first meeting armed with factual, insightful sound bites and thought-provoking questions. Treat every client as if they are the business that is keeping your business afloat. Whether a customer pays you less than what it costs to keep your printer in ink, you chose to take their business—so act like it. Don’t play hard to get – customers don’t enjoy the chase. 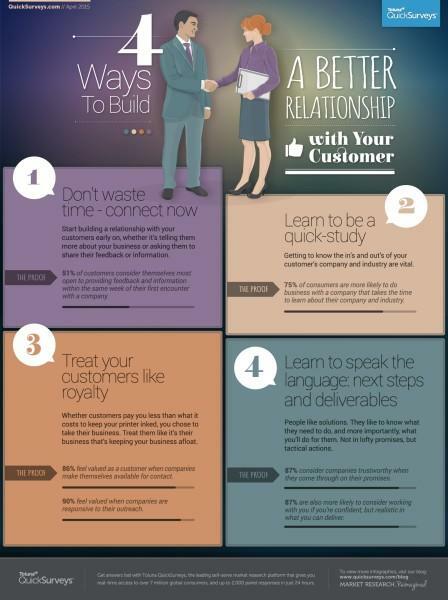 86% of people feel valued as a customer when companies make themselves available for contact and 90% feel valued when companies are responsive to their outreach. Some subscribe to the ‘within 24 hour response’ while others prefer the ‘same business day response’ rule. Depending on the nature of the query, ensure that someone, anyone, from your organization replies to a customer within a reasonable amount of time to let them know that, 1. You’ll be contacting them personally, and 2. The issue / answer is already being worked on.